Choosing the right shoes can be challenging! High heels are a very popular fashion accessory. They can look amazing but unfortunately people will often compromise comfort and foot health for the elegant look that high heels can provide. High heels place our feet and body in an unnatural position putting greater pressure on the ball of the foot. This can increase bunion development and create shortening in the calf muscles which can lead to tired and aching feet and legs. High heels can be worn for short amounts of time if the feet are stable, strong and healthy to begin with. 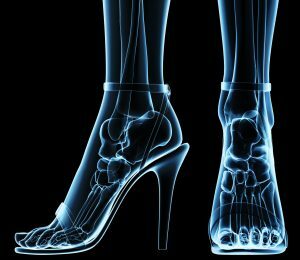 If you have poor foot alignment and function high heels can make this worse. The best recommendation is to choose a lower heel height and keep the heels for those ‘special occasions’. While thongs feel like they are the comfy option, there are some problems associated with wearing them for extended periods. For example, your feet have to essentially grasp the thongs to keep them on, and with little foot support they make your feet work harder. This can result in tired and aching muscles. Wearing them for long periods of time can also exacerbate existing mechanical conditions of the foot and leg. It is recommended that thongs only be used for short distances (e.g. to the beach). Sneakers can be the perfect shoe if chosen correctly. If the sneaker is chosen appropriately for the activities you are doing and it is fitted well, a sneaker can provide the ideal footwear. Unlike thongs, most sandals come with straps to hold the foot in place while walking. This gives your feet the openness to breathe and stay cool without increasing the work load to the feet and legs like thongs do. These types of shoes are just slipped on. And, because of this, are very popular. Court shoes don’t have any straps or buckles to hold the shoe in place, your foot has to hold on and this can create strain and pain in the feet. Boots have to be snug around the foot to stay on and this extra compression can contribute to foot problems. Once again, these can be worn for shorter periods of time if the foot is healthy and strong to begin with. When you look at an older pair of shoes, you can tell a lot about how your foot is aligned. If there are parts of the shoe that have been worn down excessively or unusually, then the biomechanics of your feet may be contributing to your foot and leg pain. These are the clues we look for and assess every day. A good shoe fitter can make the difference between healthy, strong feet and those that are suffering from foot and leg pain. Look for trained and experienced shoe fitters. 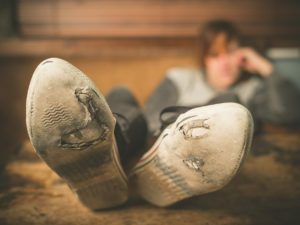 Make sure your shoe fitter has received training and is experienced. Always shop for footwear at the end of the day when your feet at are their largest. Get your feet measured for width and length and always fit the larger foot, and the longest toe. Make sure to get a shoe with some form of fastening (laces, straps, velcro) – your feet will thank you! If a shoe doesn’t feel right, it’s probably not right! That feeling is unlikely to change. A good shoe will usually be nice and firm around your heel to help keep your foot stable. Choose natural materials such as leather or natural, breathable fibres for the upper part of the shoe. If you have custom made orthoses, take them with you when you go shoe shopping.